Jobs are a great way to track what employees work on during their shift. You can customize jobs to represent whatever you want – a client, a location, a specific task / project, etc. A shift can have multiple jobs under it, and every job belongs to a specific shift. 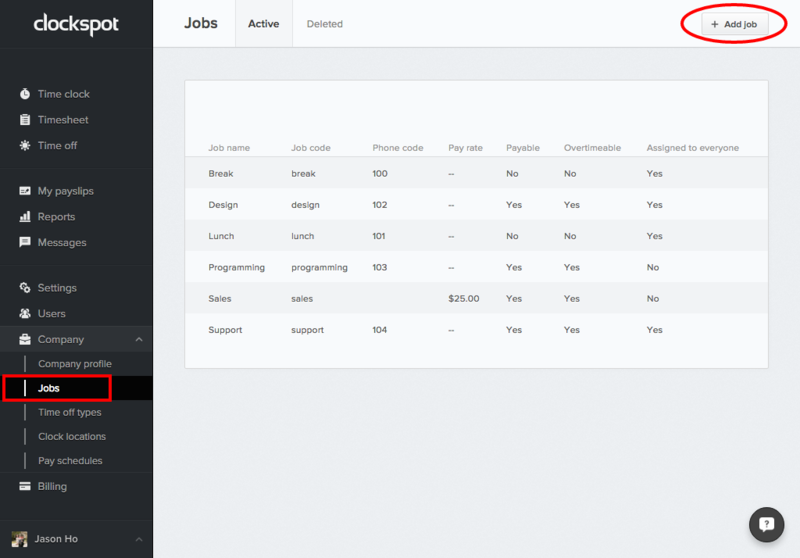 To add a job type, click on “Company” in the left menu, then select the “Jobs” subpage under it. You should then see an “Add job” button at the very top bar on the right. To edit or delete a job, click the job (it should highlight if you hover over it), then click “Actions” to see a list of options. When you create your account, we automatically add two common jobs “Lunch” and “Break”, which are set up as unpaid jobs. Feel free to edit the jobs, or delete them if they don’t apply to your business. If your employees clock in with our toll-free number, you’ll notice we have the option to start/stop job by phone. To use this feature, make sure to include a phone code when you add a job. Phone codes can be any number you want, for example “1” or “403”. What’s the difference between a job code and a phone code? Job codes are typically a string like “client123”, which is used for accounting purposes, while a phone code is used mainly for employees to be able to enter a number on their cell phone to start a job.